Made Our First Home Offer Today! Today we went house shopping and found a home we love! 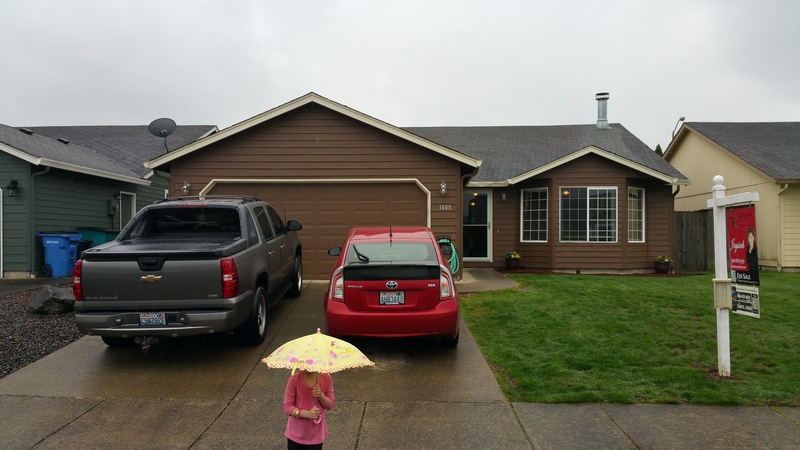 It has 3-bedrooms (plus a little office), 2 baths, 1,547 sq. ft. and it’s located in Battle Ground, WA (the town we want to live in). Emma standing in front of the house we made an offer on today. We looked at several other homes today but this was by far our favorite. I love the open floor plan and the fact it has an office already built out in the garage (which is perfect because it’ll be quiet to work out there). So we decided to make an offer! This is the first time we’ve ever made an offer on a home so it’s pretty exciting for us. The asking price is $250,000. We qualified for a $250,000 USDA Loan and a $350,000 FHA Loan. We’re trying to keep our monthly expenses low and not get in over our head so the $250,000 option is a lot more appealing to us. Plus, our goal is to own our home free and clear eventually so it’d be harder to come up with another $100,000 if we went with a higher priced home. And since the USDA Loan are “ZERO Down” loans all we have to pay is the “earnest money deposit” (around $2,500), and closing costs (about $7,000 which will be due about 45 days after an offer is accepted). Then our monthly mortgage payment will be about $1,600 (includes taxes and insurance). I called the utility company and they said the high was $270 and low was $110 for electric. And probably about $75 every 2 months for water and $25/month for garbage. So I’m estimating around $250/month for utilities. So that’s what’s happening in my world today. I also sent a couple bids out today for copywriting projects (one was for a sales page and a 13-part email campaign and the other was for an Epic 5,000-word blog post). And I met with my sister-in-law, Cailee, who I’m coaching to be a freelance writer. So all in all, a pretty good day! We’ll see what happens with the house.